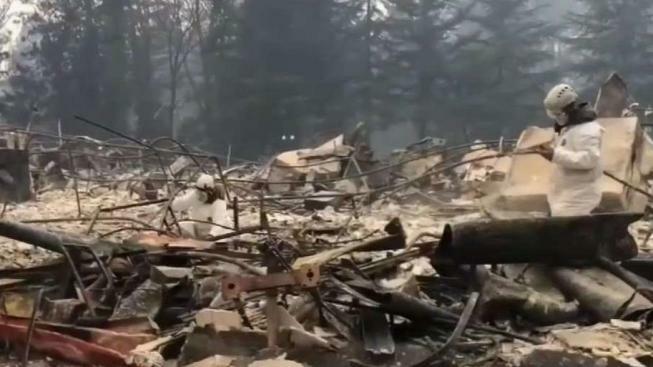 Nearly two weeks after the devastating Camp Fire nearly destroyed the entire town of Paradise, hundreds remain missing. And searchers are now trying to cover as much ground as they can before stormy weather moves in. NBC Bay Area’s Jodi Hernandez reports. Rain in the forecast starting Wednesday could aid crews fighting California's deadly wildfires while raising the risk of flash floods and complicating efforts to recover remains of those killed. Residents in communities charred by the Los Angeles-area fire stacked sandbags as they prepared for possible downpours that threatened to unleash runoff from hillsides left barren by flames. With the death toll at 81 in the state's most destructive wildfire, there are still nearly 870 people still unaccounted for. Butte County Sheriff Kory Honea said the additional 171 names came from a backlog of voicemails that detectives worked through Tuesday. Authorities had said Monday there were 699 people unaccounted for. Authorities trying to identify the scores of people killed are using rapid DNA testing that produces results in just two hours. The system can analyze DNA from bone fragments or other remains, then match it to genetic material provided by relatives of the missing. But the technology depends on people coming forward to give a DNA sample via a cheek swab, and so far, there are not nearly as many volunteers as authorities had hoped for. As of Tuesday, nearly two weeks after the inferno, only about 60 people had provided samples to pop-up labs, said Annette Mattern, a spokeswoman for ANDE, the Longmont, Colorado, company that is donating the technology. The burned area surrounding Paradise, which is about 140 miles (225.3 kilometers) northwest of San Francisco, will see rain starting Wednesday. The precipitation could help knock out the flames, but it could also hinder the search by washing away fragmentary remains and turning ash into a thick paste. The Camp Fire, which has burned an area about the size of the city of Chicago — nearly 238 square miles (616 square kilometers) — and destroyed around 13,000 homes, was 75 percent contained on Tuesday. In Southern California, people who worried days earlier that their homes might be consumed by flames were now taking action to guard against possible debris flows caused by the Pacific storm set to come ashore the day before Thanksgiving. Residents filling sandbags at Malibu's famous Zuma Beach were mindful of the disaster that struck less than a year ago when a downpour on a fresh burn scar up the coast sent home-smashing debris flows through Montecito, killing 21 people and leaving two missing. Associated Press journalists Christopher Weber and John Antczak contributed to this report.